The actor was arrested after becoming belligerent with TSA officials when he was passing through security, it has been reported. 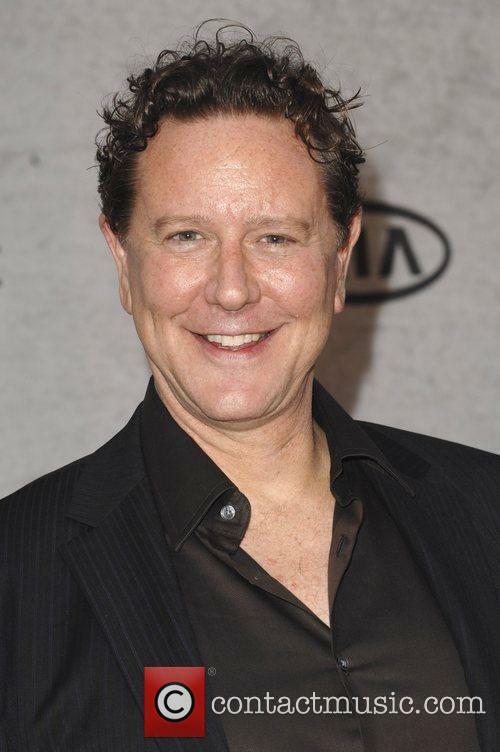 Film actor Judge Reinhold has been arrested on a charge of disorderly conduct after reportedly causing a disturbance in a security queue at Dallas’ Love Field airport. The 59 year old star, who is famous for his roles in the ‘80s in Beverly Hills Cops and Fast Times At Ridgemont High, was said to have gotten belligerent when he was selected for a random security check by Transport Security Administration agents on Thursday afternoon (December 8th). TMZ reported that Reinhold refused to co-operate with officials, even when they offered to conduct the search in a separate room. Eddie Murphy was honoured by his peers for his outstanding contribution to film, TV, music and stand-up over his 30 + year career. Chris Rock, Jamie Foxx, Adam Sandler, and Russell Brand were just some of the famous faces at the Beverley Hills gala being aired on Spike later this month (it airs Nov. 14 at 10 p.m. on Spike). 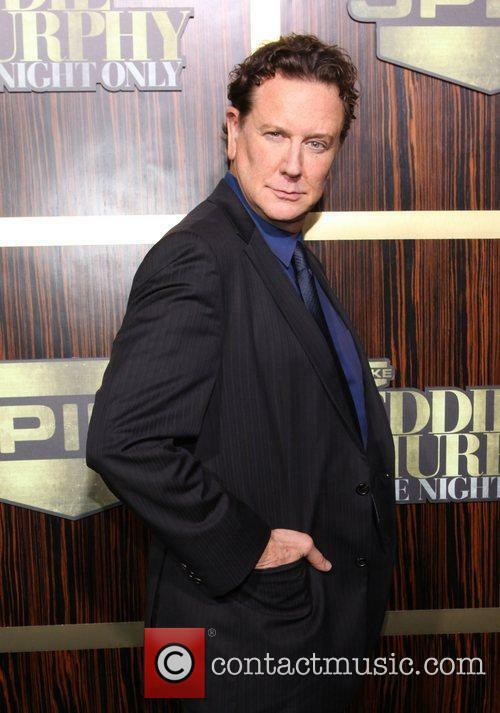 Murphy's friends and co-stars had nothing but praise for Murphy, with his appearances on such comedy classics as Coming To America and The Beverley Hills Cop being recalled by co-stars Arsenio Hall and Judge Reinhold. Jeffrey Katzenberg of Dreamworks Animation also gave his heart to Murphy's Donkey character from the Shrek films, whilst his Life co-star, Martin Lawrence, told him from onstage, “You’ve got a friend for life." There were also video highlights from the funny man's seminal stand-up performances from the 80's, Raw and Delirious, although despite much attempted persuasion Murphy declined to get back on stage and perform stand up again. Of the many things I dislike about the Santa Clause series, the one that bothers me the most, the very very most, is this: Now, whenever any of the critics on this site tries to write the name "Santa Claus" they almost invariably spell it "Santa Clause." That extra "e" is absolutely maddening, and it is everywhere I look, unintentionally. 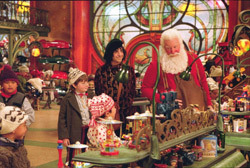 Against all odds, the e-happy Santa Clause series is back with a third installment, which involves Santa (Tim Allen) facing off against the Napoleon-complexed Jack Frost (Martin Short), who's got his eyes on the prize of being the supremo wintertime icon. His idea is to take advantage of a rare "escape clause" which lets Santa step down willingly if he says a certain phrase, so Frost can sieze the big red suit. Naturally, trickery is involved. Apparently Jack Frost is a very bad boy. You can tell by the fright wig hairdo. 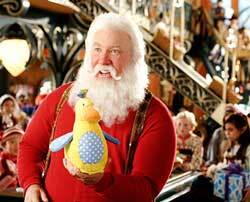 Eight years ago, Scott Calvin (Tim Allen) inadvertently caused the death of Santa Claus. Ever since, he's been wearing the bright red suit himself, delivering countless toys to millions of children all over the world on one special night a year. This Christmas, however, things aren't going as smoothly for Santa, because he hasn't yet fulfilled an important part of his contract...the part about a Mrs. Claus. Calvin must find a wife before Christmas Eve, because if he doesn't, his duties as the head Claus will vanish forever! Apart from the North Pole, much has changed since the original Santa Clause. Calvin's son, Charlie (Eric Lloyd), has become an embittered teenager who rebels against society by spraying graffiti on the walls of his school. Charlie's mother and stepfather (Wendy Crewson and Judge Reinhold), blame his misbehavior on Calvin's absence, but Principal Newman (Elizabeth Mitchell) doesn't care about the reasons behind the misbehavior, she just wants it to stop. Yet another entry into a genre popularized in the late-1990s: The Hollywood romantic comedy about the successful man who just can't make romance work. (Later this would evolve into the woman who just can't make romance work genre, followed by the lesbian who just can't make romance work genre). Saddled with the worst title you could give to a comedy, Enemies of Laughter gives us David Paymer as Paul, a semi-failed sitcom writer whose experiences in Hollywood are echoed in his love life. He ends up on dozens of dates with your typical collection of L.A. airheads, but it isn't until he meets Carla (Rosalind Chao) that Paul figures he's met his match. Too bad he ruins their date with paranoid crazy-talk, sending Carla running for the hills. Boy, looking back at Berverly Hills Cop, almost 20 years after its original release, it's easy to see why people fell in love with the movie, earning a then unheard-of of $316 million worldwide (the highest grossing R-rated movie ever) and propelling Eddie Murphy from a funny ensemble player in films like Trading Places and 48 HRS. to a megastar. Beverly Hills Cop is actually a bit of a nutty idea -- combine a standard cop actioner with a fish out of water tale. 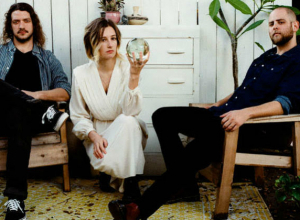 Who would've thought that would be any good? But it works, and how, with Murphy turning in perhaps his funniest performance ever -- mocking the supporting cast at every turn (favorite targets: gay men, uptight men, and gay/uptight men) and tossing off one-liners like he's got a wad of them stuffed in his pocket. His Axel Foley, one of the most widely impersonated characters in film (remember the popularity of the "Mumford Phys. Ed." sweatshirt? ), heads from rough-and-tumble Detroit to prim-and-proper Beverly Hills to investigate the murder of his best friend, uncovering a much bigger plot, of course. Attempting to bring the Christmas movie into the 1990s, Disney enlisted drug offender and raunchy stand-up Tim Allen to play Santa Claus based on the strength of his TV show Home Improvement. 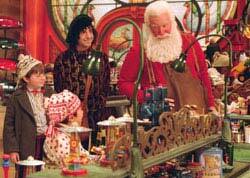 Funny then that The Santa Clause would indeed become a minor classic of the genre considering its iffy pedigree. Credit that to a clever script that has Santa falling from a roof on Christmas Eve (and presumably dying in the process -- be ready to explain that to the kids) and Allen's Scott taking up his job after donning the Santa suit. Scott then has a year to prepare to take over the job full time. This mainly works out to Scott's putting on a ton of weight and growing a Santa-style beard, all the while denying he is becoming Mr. Claus. At least one of the seven credited writers of the sequel-for-sequel's-sake holiday kiddie flick "The Santa Clause 2" clearly felt obliged to try to remedy the picture's contemptibly contrived premise by writing some really funny dialogue. And at least for-hire director Michael Lembeck (a sitcom vet making his screen debut) managed to infuse the movie with a fun, touching, sweet spirit. But these acts are akin to Christmas miracles, coming as they do under the burden of a plot -- scratch that, a gimmick -- that revolves around finding even more fine print on the calling card of a dead St. Nick, which turned divorced suburban dad Scott Calvin (Tim Allen) into Santa Claus in the original family comedy from 1994. It seems the elves waited eight years to inform their new Santa that he has until this Christmas to find a Mrs. Claus -- or else. "The de-Santafication process has already begun," frets head elf Bernard (David Krumholtz) as he shoos Scott off to find a wife. Meanwhile cherubic techie-elf Curtis (played by Spencer Breslin, one of those child actors who runs all his lines together without taking a breath or showing a hint of inflection) clones a big, rubbery toy Santa automaton (played by Allen in heavy prosthetic makeup) to stand in for Scott (unconvincingly) so the other elves won't learn of his predicament and panic at his absence.